Life can drastically change in a split of a second. Usual life gone forever, turned into a new one, a life of hardships, struggle and pain. 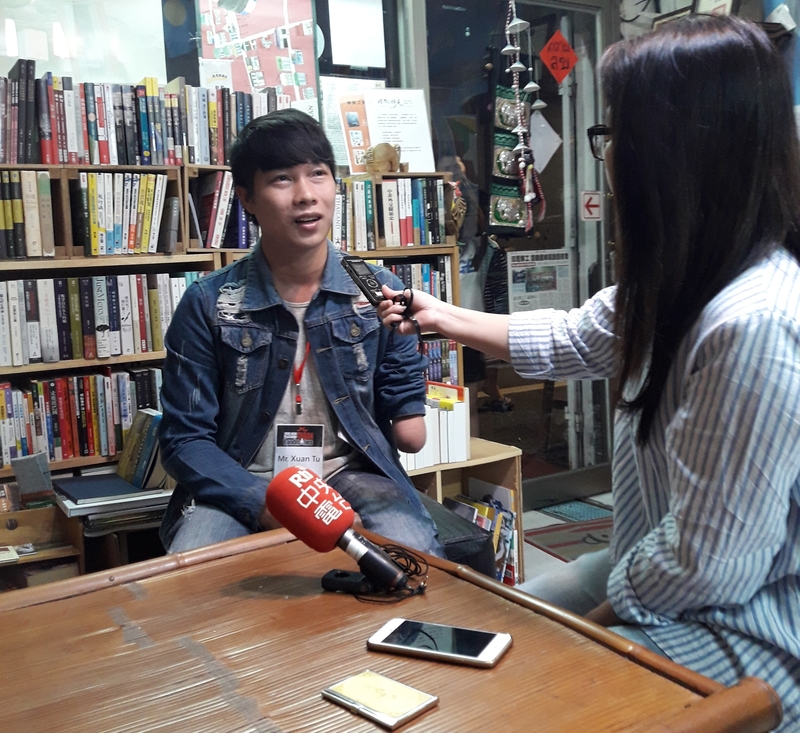 “I am a landmine survivor and, more than anyone else, I am aware of the effects of landmines,” Phan Xuan Tu says, anti-landmine youth ambassador from Vietnam. Phan Xuan Tu was a regular11-year old boy from a farmer family. He often helped his parents, by working the farm and catching clams, to earn some money to cover his tuition fee. That day, this lively boy was catching clams in the river when the bomb explodes. The 2nd of June 2001, his life fell apart. Seriously injured, Phan Xuan Tu spent two months and a half under medical care in Vietnam-Cuba hospital. When he gained consciousness back, his left arm and left leg were gone. This is how his life as a disabled person started, his life as an “abnormal” person. After the physical pain came the psychological misery. People’s reprobating eyes and criticizing whispers made him feel inferior. He eventually hides from the whole world, feeling constantly exposed and out of place; his distress leading him to think about death. If it wasn’t for his family’s and his close friends’ love and support, he wouldn’t have overcome his grief. “I don’t care anymore about what people say, what people think; I have been hurt for long enough now; I have to pull myself together. I started with my friend to share our landmine survivors experience and join several activities about landmines, to call on everyone to not use landmines.” Phan Xuan Tu says. Now, in addition to his hook making labour, he became an anti-landmine activist and youth ambassador for landmine survivors in Vietnam. Eighteen years after the incident, Phan Xuan Tu is fully involved in this mission fate has given him, his mission to advocate to ban landmine and help the victims. For this Act Today, No Fear Tomorrow workshop in Taiwan in the beginning of May 2018, Phan Xuan says: “I hope that this trip will help me learn more experiences, have more motivations from the real-life examples in order to accumulate more energy and bring the things that I learn to help others rise up in life and not become a burden to the society”, and during the workshop sessions, there was this spark in his eyes. A spark of glee, like a child amazed by the life. A spark of torment, of a person who went through a lot of hardships. But also, definitely, a spark of determination, to lead this fight further and overtake the landmine issue.